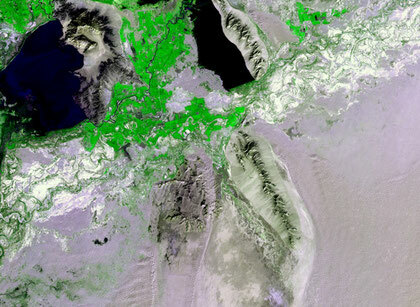 World Arid Zones From Space - jaals's JimdoPage! 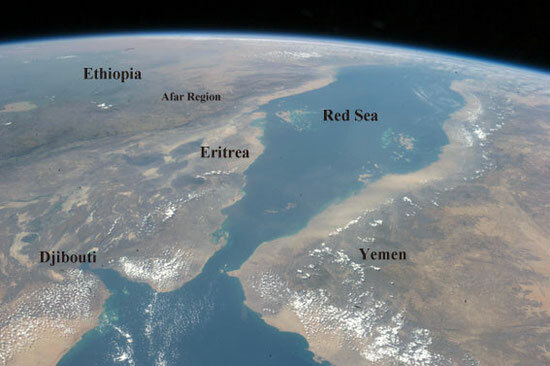 "Eritrea, Yemen, Ethiopia, Afar Region and Pan-Red Sea"
The Afar Depression, also known under the outdated name Danakil Depression, is part of the Great Rift Valley of Ethiopia, and is located in the north of the region. It has the lowest point in Ethiopia and one of the lowest in Africa. The southern part of the region consists of the valley of the Awash River, which empties into a string of lakes along the Ethiopian-Djibouti border. Other notable landmarks include the Awash andYangudi Rassa National Parks. (Text by Wikipedia), Image by ISS, NASA. ©NASA-JSC. 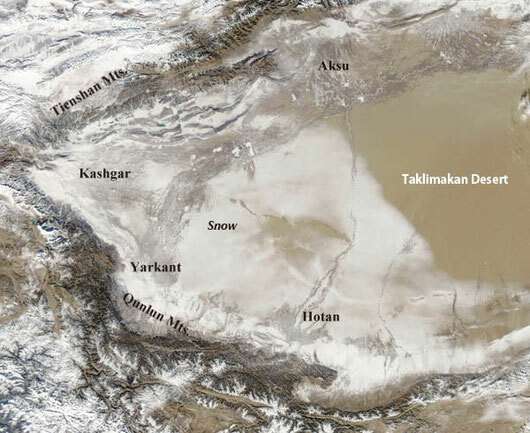 Snow-covered deserts are rare, but that’s exactly what the MODIS on NASA’s Aqua satellite observed as it passed over the western part of Taklimakan Desert on January 2, 2013. Snow has covered much of the desert since a storm blew through the area on December 26. The day after the storm, Chinese Central Television (CNTV) reported that the Xinjian Uygyr autonomous region was one of the areas hardest hit. 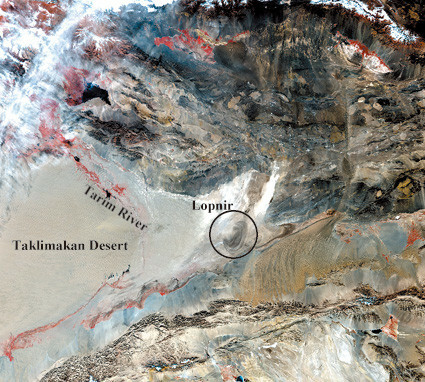 In the area at the very far eastern corner of China’s Taklimakan Desert, Lop Nor was located up until some years ago. Lop Nor, also called the “the heart of the heart” of Asia, where the waters of the largest inner basin of the world—including the Tarim and Kum-daria Rivers—were collected. Depending on the balance between rainfall water yield and evaporation, both position and size of the lake were strongly variable, thus giving rise to the legend of the Wandering Lake. Credit: Caption and image courtesy Luca Pietranera, Telespazio, Italy based on data from the MODIS Science Team, NASA. 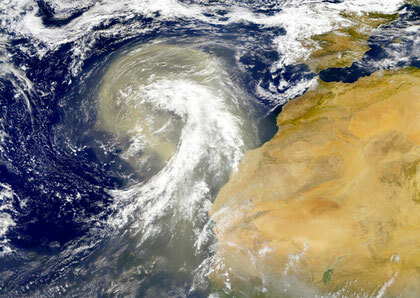 The north African winds, known as sirocco, blow dust west out over the Canary Islands and the Atlantic Ocean from Morocco in this SeaWiFS image. ©NASA/GSFC, and ORBIMAGE. This image shows a large cloud of Saharan Desert dust (tan pixels) blowing westward over Niger, Mali, and Mauritania in northwestern Africa. 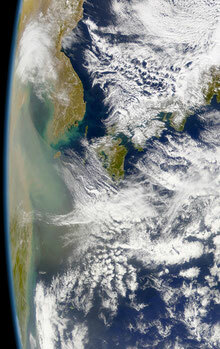 The dust can also be seen extending westward over the Atlantic ocean in this scene. The bright feature in the eastern Atlantic (image bottom center) is sunglint, caused when the Sun's rays are reflected off the surface of the ocean directly back at the satellite. 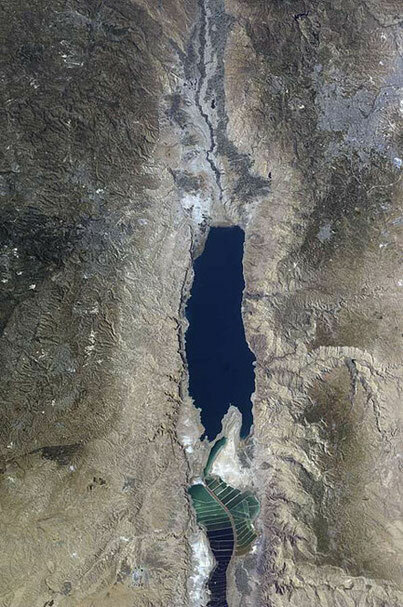 This image was acquired on October 11, 2004, by the MODIS aboard NASA's Aqua satellite. ©NASA/GSFC. The Aral Sea has shrunk to less than half its size since 1985. The Aral Sea receives little water (sometimes no water) from the two major rivers that empty into it—the Syr Darya and Amu Darya. Instead, the river water is diverted to support irrigation for the region’s extensive cotton fields. Recently, water scarcity has increased due to a prolonged drought in Central Asia. As the Aral Sea recedes, its former sea bed is exposed. 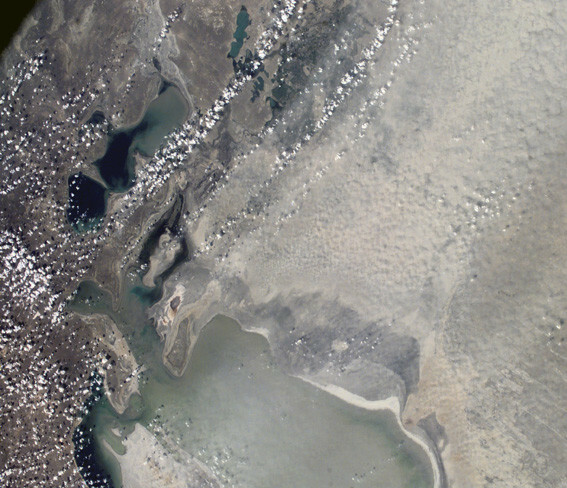 The Aral’s sea bed is composed of fine sediments—including fertilizers and other agricultural chemicals—that are easily picked up by the region’s strong winds, creating thick dust storms. Credit: The image was acquired on 30, June 2001 by ISS, NASA. ©NASA-JSC. 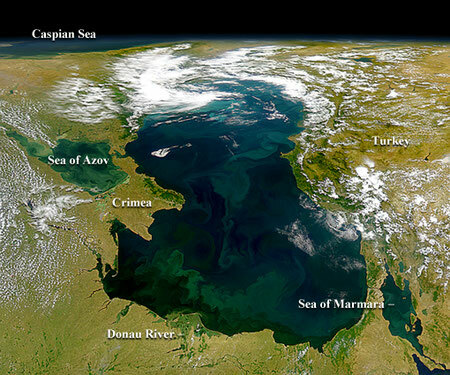 "Eutrophication of Black sea", The effects of possibly agricultural runoff in the Donau can be seen in this SeaWiFS image as the river empties into the Black Sea at the bottom of this image. ©NASA/GSFC, and ORBIMAGE. 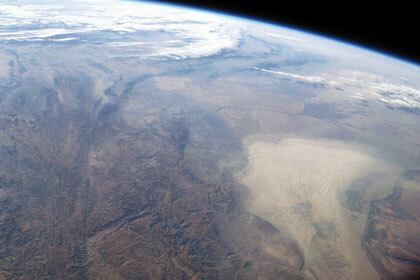 Spectacular scene of Tienshan mountains lies to the north and west of the Taklamakan Desert view from space. ©NASA/GSFC. 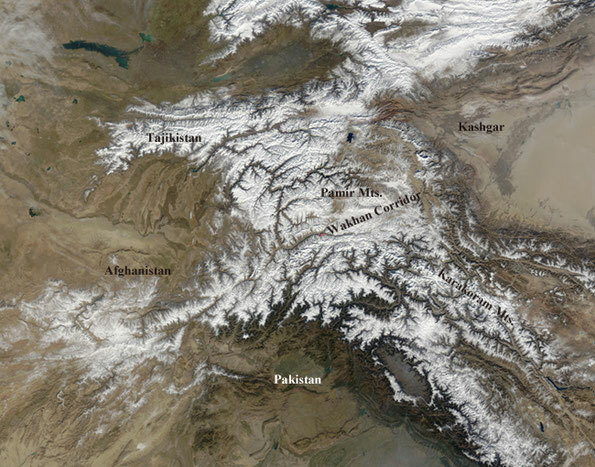 Several mountain ranges bunch together in central Asia. 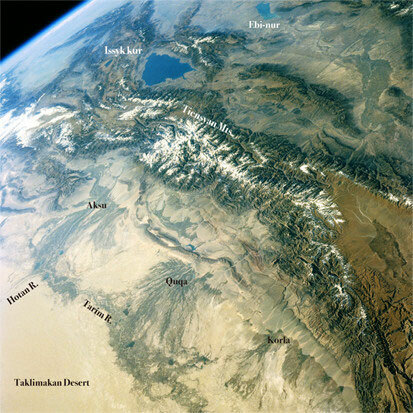 The ranges shown in this image include the Alay Mountains and the Pamirs of Tajikistan and Kyrgyzstan top the Vakhan Karakoram Range of Afghanistan, Pakistan, and India center and the Hindu Kush which divide Afghanistan and Pakistan. With autumn settling in the mountains are covered with snow. During the hot summer only the highest peaks maintain their white caps. The MODIS on Terra satellite acquired on October 22, 2004. ©NASA/GSFC. Over the past three decades, Saudi Arabia has been drilling for a resource more precious than oil. 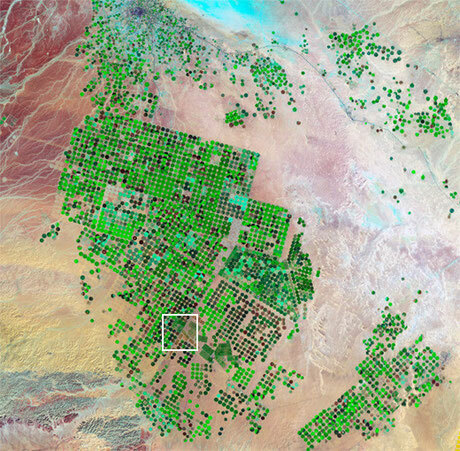 Engineers and farmers have tapped hidden reserves of water to grow grains, fruits, and vegetables in the desert.The images shows the evolution of agricultural operations in the Wadi As-Sirhan Basin, as viewed by satellites in 2012. The images were captured by Landsat satellites 7. 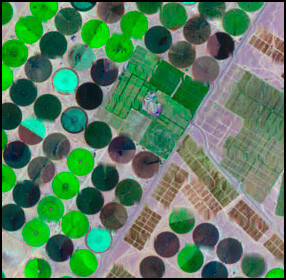 For scale, the agricultural fields in the images are about one kilometer across and use center-pivot irrigation. ©NASA, USGS. Enlargement of a part of above image. 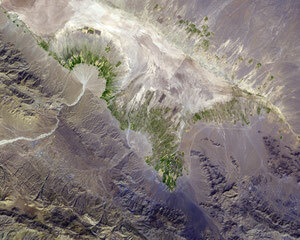 Brilliant green alluvial fan in the Zagros Mountains of southern Iran. The image was captured by the ASTER on October 12, 2004. Also refer right Google map. ©NASA/GSFC/ERSDAC, and the U.S./Japan ASTER Science Team. A part of Bosten lake (dark blue) and Yanqi oasis. It is a freshwater lake located 57km, northeast of Korla, Xinjiang. The red areas show farmland. Image center is approxim. 42/00/N, 86/51/E. The image was acquired by JERS-1 on 4th, Nov. 1992. ©ERSDAC. 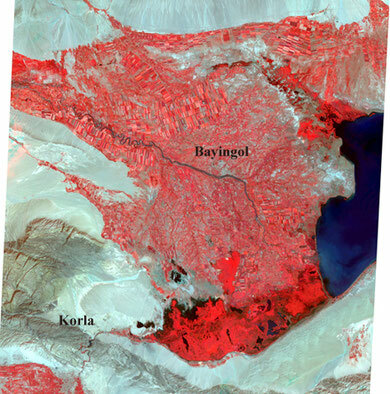 "Distribution of NDVI in Hotan"
The image shows distribution of NDVI around Hotan oasis in Xinjiang Uyghur, China derived from Landsat TM data on September, 2000. Here, NIR=Near Infra-red light, VIS=Visible light. 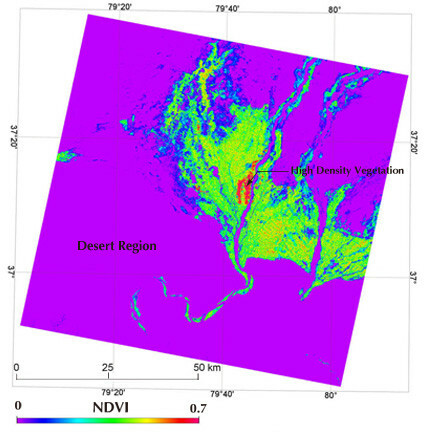 Calculations of NDVI for a given pixel always result in a number that ranges from minus one (-1) to plus one (+1); however, no green plants like in desert gives a value close to zero. A zero means no vegetation and close to +1 (0.8 - 0.9) indicates the highest possible density of green plants in farmland. Also red areas of image center indicate an irrigated rice field. Text by NASA GSFC, T. Ishiyama. Image: 2006 ©T. Ishiyama. "Reservoir, Farmland and Desert a periphery of Qilan Oasis"
Qilan is located close to Bachu at northwestern edge of Taklimakan Desert. Black and pale violet areas indicate reservoirs, desert respectively. Visualization by T. Ishiyama (JAPAN-US ASTER Science Team Member). Dead Sea, Jordan, The lake surface is nearly 400 meters below sea level. The only outlet for the water is evaporation. Deep waters are dark blue, light and dark green show salt ponds and wetlands to the south. The image was acquired on 20, April, 2012 by ISS, NASA. ©NASA-JSC. The Azores Is. are visible at the northwest edge of the dust plume in this SeaWiFS image. 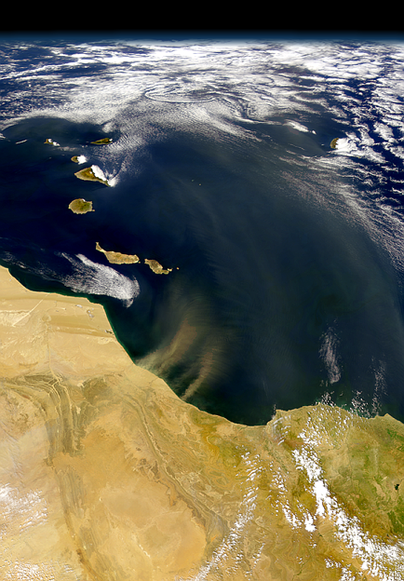 The Cape Verde Islands, is located in the Atlantic Ocean, approximately 570 kilometres off th can be seen through the dust near the bottom of the image. ©NASA GSFC. 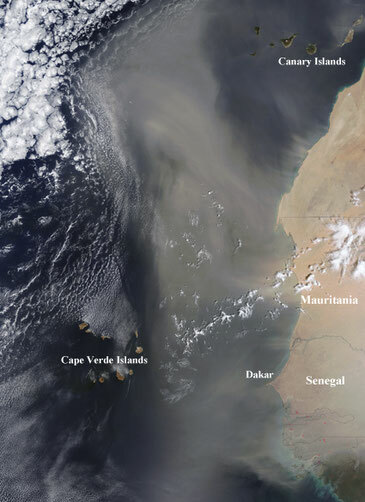 "Thick Dust Hovers Over the Atlantic Ocean"
Thick dust hovers over the Atlantic Ocean west of Western Sahara, Mauritania, and Senegal in this image. Dust storms such as this one regularly blow out of Africa’s Sahara Desert, occasionally pushing dust as far as Florida and the Caribbean. ©NASA GSFC. 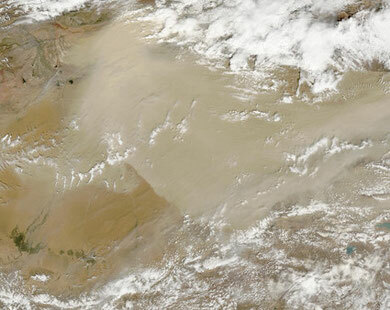 Dust storm covers Turkmenistan in central Asia. Winds blowing down the largest river valley in the region, the Amudarya, were strong enough to raise a large dust storm. The image was acquired by ISS, NASA. ©NASA-JSC. 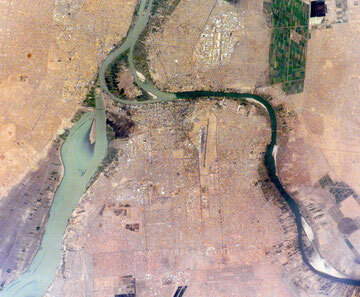 Sudan, Khartoum, translates as “Elephant’s Trunk.” The name describes the shape of the Nile where the Blue and the White Nile Rivers unite to form the single Nile River that flows northward into Egypt. The image was acquired by ISS. ©NASA-JSC. 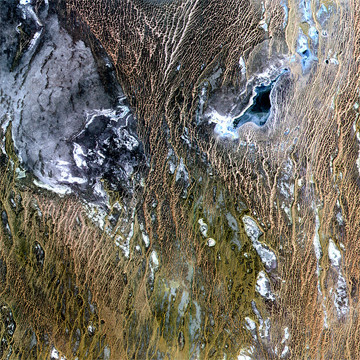 Northern part of the Karakum Desert in Turkmenistan. The image was acquired by ASTER. ©ERSDAC, Japan. All-American Canal on California-Mexico border. The image was acquired by ISS, NASA. ©NASA-JSC. Click on this picture. 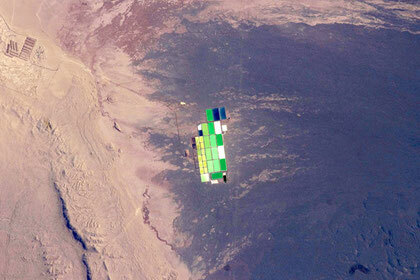 Brightly colored solar evaporation (salt) ponds in a desert landscape give this ISS image. The ponds sit near the foot of a long alluvial fan in the Pampa del Tamarugal, the great hyper-arid inner valley of Chile’s Atacama Desert.©NASA GSFC. 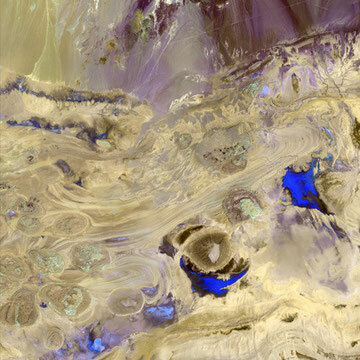 Like swirls of paint on an enormous canvas, shallow lakes, mudflats, and salt marshes share the sinuous valleys on Iran’s largely uninhabitated Dasht-e Kavir, or Great Salt Desert. 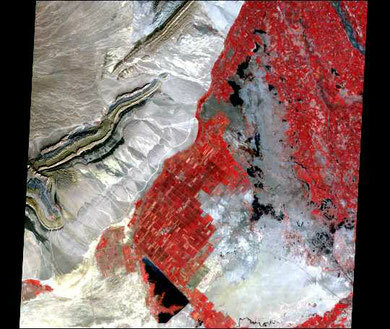 This image was acquired by Landsat 7. ©NASA JPL. 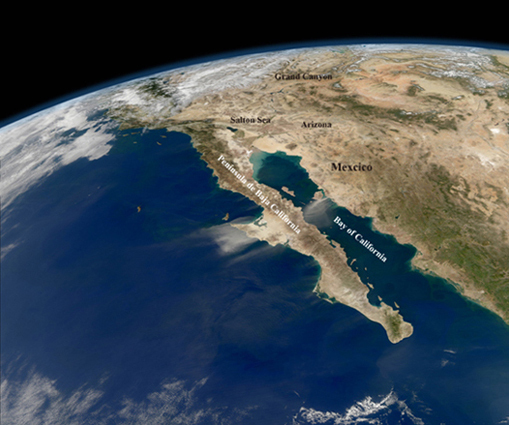 Mostly cloud-free skies and a compelling view of the entire length of Baja California and the Pacific coast of Mexico. In the midst of the clarity, strong northeasterly winds stirred up dust storms on the mainland and the peninsula. ©NASA GSFC. The Tifernine Dune Field is located at the southernmost tip of the Grand Erg Oriental, a “dune sea” that occupies a large portion of the Sahara Desert in eastern Algeria. The image was acquired by ISS, NASA. ©NASA-JSC. Yemen in the southwest of the Arabian Peninsula. 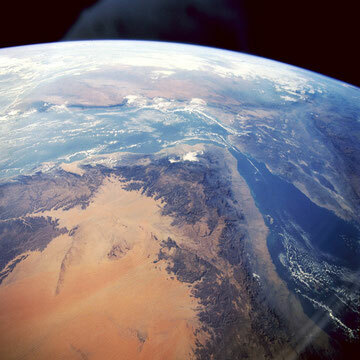 This spectacular scene was acquired by ISS, NASA. ©NASA-JSC. "Large dust storm struck Taklimakan Desert"
A large dust storm struck Taklimakan Desert. Big, dry, hot, and about as far from the ocean as anyplace on Earth, the Taklimakan Desert provides plenty of material for dust storms. The image was acquired by TERRA MODIS on April 28, 2004.©NASA GSFC. Salar del Hombre Muerto, in northwestern Argentina. 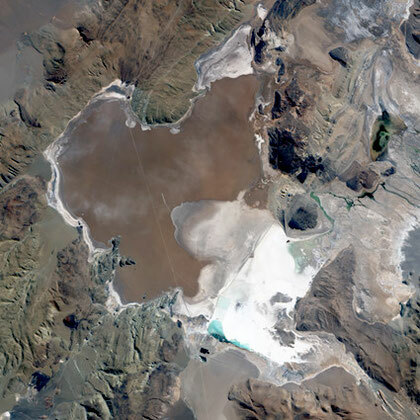 A salar is a salt pan, created when water repeatedly evaporates from a shallow lake, leaving behind a crusty layer of salt minerals, which are brilliant white in EO-1 satellite image.©NASA GSFC. 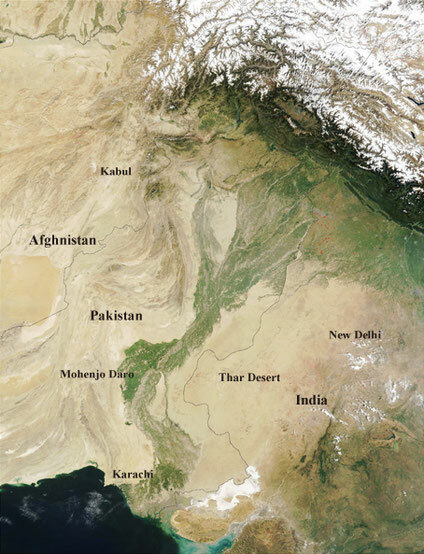 The image feature the Indus River Valley, a lush oasis of vegetation made possible by the Indus River, which is visible as a thin black thread heading toward the Arabian Sea. The Indus River has its roots in the Himalayas, and is fed from melting snows from three major mountain ranges and five Indian rivers. The Indus River valley was the home of a great ancient civilization - the Indus Valley Civilization - that lasted for about a thousand years and at its height controlled more territory than ancient Egypt or Mesopotamia.©NASA GSFC. "Tengiz and Korgaljinski Lakes, Kazakhstan"
In north-central Kazakhstan lie a series of ponds and lakes connected by the Nura River. In the west is Lake Tengiz, a salt lake with no outlet and fluctuating depth. 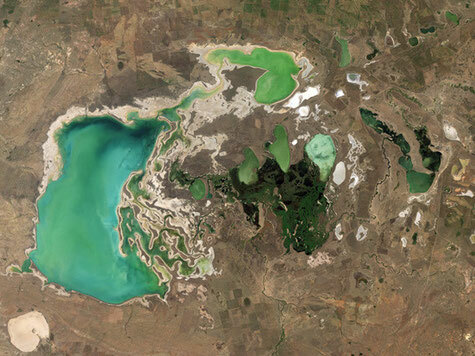 In the east are the Korgaljinski (or Kourgaldzhin) Lakes, a network of freshwater lakes mixed with marshland. Home to hundreds of plant and bird species, and dozens of mammal species, the area has been designated a Ramsar wetland site. 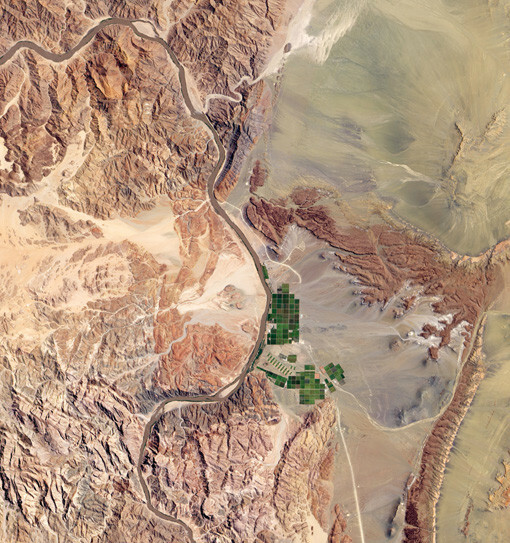 The image was captured by the Landsat 7 on July 29, 2001. ©USGS, NASA. Located in the Northern Territory of Australia, Uluru-Kata Tjuta National Park hosts some of the world’s most spectacular examples of inselbergs, or isolated mountains. 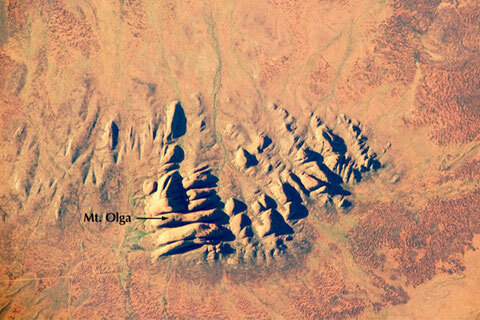 The most famous of these inselbergs is Uluru (Ayers Rock), view from ISS. ©NASA-JSC. 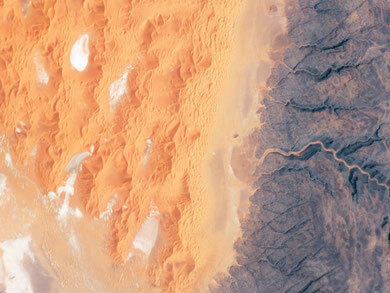 The Orange River serves as part of the border between Namibia and the Republic of South Africa. Along the banks of this river, roughly 100 kilometers (60 miles) inland from where the river empties into the Atlantic Ocean, irrigation projects take advantage of water from the river and soils from the floodplains to grow produce, turning parts of a normally earth-toned landscape emerald green. 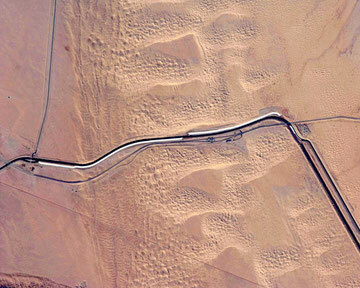 The Advanced Land Imager (ALI) on NASA’s Earth Observing-1 (EO-1) satellite captured this image on February 17, 2010. A network of bright rectangles of varying shades of green contrasts with surroundings of gray, beige, tan, and rust. Immediately south of a large collection of irrigated plots, faint beige circles reveal center-pivot irrigation fields apparently allowed to go fallow. Credit: NASA Earth Observatory image created by Jesse Allen, using EO-1 ALI data provided courtesy of the NASA EO-1 team and the USGS. Caption by Michon Scott based on information provided by Guido Van Langenhove, Hydrological Services Namibia, Department of Water Affairs. 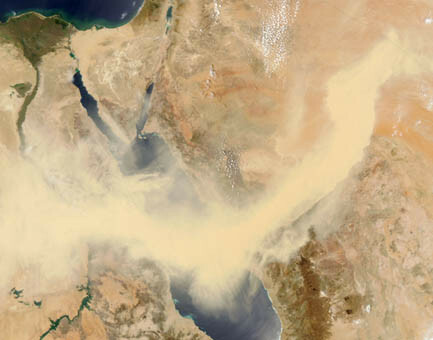 "Dust across the Red Sea between Egypt and Saudi Arabia"
A thick band of dust was snaking across the Red Sea between Egypt and Saudi Arabia on May 13, 2005. The light tan dust plume is hundreds of kilometers across and so thick that it completely hides the surface in places. Although it is difficult to tell from this single image where the dust cloud originated and which way it is moving, additional satellite data collected over several hours by the METEOSAT satellite reveal that the event began to the northeast of the area shown here, in the vicinity of Jordan. The image of the region was captured by the MODIS on Aqua satellite on May 13, 2005.©NASA GSFC.